Who carved el Fuerte de Samaipata, the largest carved stone in the world? Who Carved El Fuerte de Samaipata? El Fuerte (meaning “The Fort”), near the picturesque town of Samaipata in Santa Cruz, Bolivia is an ancient pre-Colombian ritual site and is the largest carved rock in the world. It was declared a Heritage of Humanity site by UNESCO in 1998. Mystery and legends surround this fortress, as no one is sure who carved it. It is the largest single rock carving in the world. It is an outcrop of sandstone about 220 meters long by 60 wide. Located 2-3 West of the city of Santa Cruz, the site was first discovered by Spanish colonists who had settled in the area in the 16th century, and established the town of Samaipata. But they soon abandoned the area, and the town and ruins were covered with vegetation until scholars took notice of it again in the late 1700's. 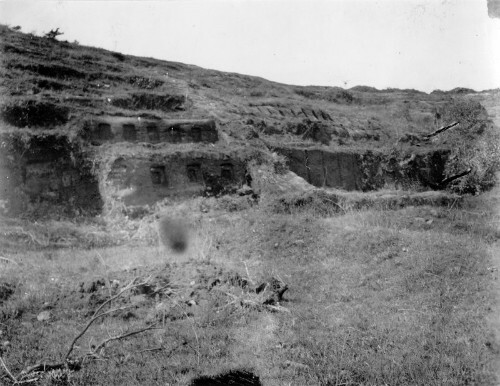 Excavation began in the early 1900's. The reigning theory, although there are archeologists who disagree with it, is that the Chané sculpted the rock. The Chané inhabited the area around the year 300, and it is believed that the first petroglyphs were carved into the rock at about that time. They were a peaceful culture, primarily farmers who traded with the Inca to the West. Meanwhile the Guaraní (whom the Spaniards called Chiriguanos) were constantly attacking and invading and eventually conquered the Chané. The Incas were advancing Eastward as well, conquering and assimilating other cultures, and the Chiriguano halted their advance. Eventually, in the fourteenth century, the Chané and the Incas formed an alliance against the Chiriguanos. Because of this, the Inca left vestiges of their presence near El Fuerte as well. On the South side there are remains of houses and a rectangular structure that could have been consecrated to the god of the rainbow. Images of two condors and representations of Manco Capac and Mama Ocllo, the mythical founders of the Andean empire, who would have stopped at Samaipata in their exodus from Titicaca, have been found on the upper face of the rock. By the sixteeth century, the Chiriguano had conquered and dominated the area. In the mid-sixteenth century, Spanish settlers seized the strategic area for communication between Asunción and Santa Cruz with the Andean colonial centers of La Plata (Sucre) and Potosi, where the exploitation of silver mines had begun. A fort was built at the rock to stop the Chiriguanos, which is why the rock is still called "El Fuerte" (the fort) today. 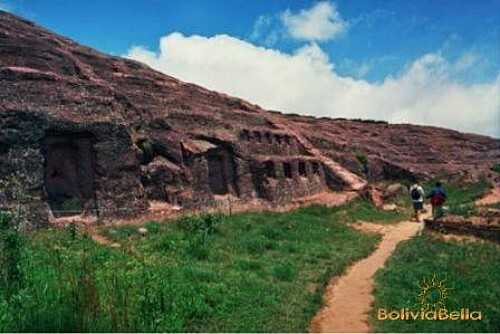 However, with the foundation of the town of Samaipata about 6 km to the west, the rock itself lost military importance and was eventually abandoned. The rock contains carvings of jaguars, cats, snakes and other animals as well as several deep pits and long grooves and channels presumably used to circulate and store water. At the top of the stone there is a circle of 12 seats with a set of 3 seats in the middle. Locals call this the "Coro de los Sacerdotes" or "Choir of Priests". The Incas occupied the site during the 1300's as well, adding several buildings, and carving out the hillsides with their traditional land terracing system of agriculture. There is also a series of niches they cut into the entire length of the right side of the rock. These would have had roofs at one time, as would the remains of several houses found about a hundred meters further on. These are all very similar to temple niches and houses found at Machu Picchu, the great Incan Ruins in Peru. You can either stop at El Fuerte on your way to town take a tour later, once you've settled into a hotel or hostel in Samaipata. Vehicles will take you up to a flat area at the base of the carved rock and you have to hike a little from there. You'll be able to see how small huts were built around the base of the stone, and view excavated portions of an adjoining village nearby. You'll pay a small entrance fee and this helps with upkeep of El Fuerte and its associated museum. As this is a UNESCO site, and has suffered damage from tourism already, it's important to take good care of it. Climbing onto the fuerte is not allowed. There are paths and a viewing platform. You can walk all the way around the rock, but do not cross the rope barriers. In the past visitors climbed up onto the rock but this was causing damage. To the right of the rock is a short path that leads to what appears to have been a small village with ruins of several small houses and huts. You’ll also see some very, very deep holes here which may have been wells long ago. Today some are so deep, that if you throw a stone inside them, you will never hear it hit the bottom. El Fuerte at Samaipata is located high atop a hill in the “sierra” (Andes foothills) and from here the view is spectacular. The highway to the fort is completely paved and offers visitors a fantastic panorama, making the Drive to Samaipata a colorful adventure in itself. The Samaipata Fort is the main tourist attraction in the Samaipata area, but there are many other sites to see during Samaipata Tours. See our Tourist Info page for more details on getting there, when to go, what to take, and where to stay. Use the links above and below to learn more about El Fuerte de Samaipata.